Congratulations to Rene Carruthers, from Sigourney Health Care & Assisted Living, for being selected the May IMG Customer Service Superstar! Rene is one of our most dedicated employees at Sigourney Health Care and Assisted Living. She is primarily an Assisted Living aide for us, but she is always finding ways to help on the floor in the nursing facility side as well. She is constantly modeling how we put “Residents First, Employees Always”. She is the kind of person that can make you smile, no matter what kind of a day you are having. She sees the world through a “glass half full” kind of attitude, and lifts the spirits of everyone in the building. Rene would tell you herself she is not here “just to do her job”. She is here for the residents – to make their days better, their activities of daily living easier, and to remind them that they are cared for, no matter what. She helps provide activities for both the AL and the nursing facility when our activities director is out. She goes on bus rides with residents for activity outings and for doctor visits. Rene can tell you a little something personal about every resident we have, and can tell you a way to make them smile. Rene is also always helpful to our staff. If she is walking through the nursing facility to bring back AL’s lunch trays, she will take a moment to ask if the CNA’s on the floor need an extra hand while she is around. Rene recently started really helping us build our restorative therapy program back up, and is great at motivating the residents to try exercises they may be resistant to. Rene is also exceptionally fun. She is happy to help plan activities, to help with group outings, and especially to help with groups coming in to the building. 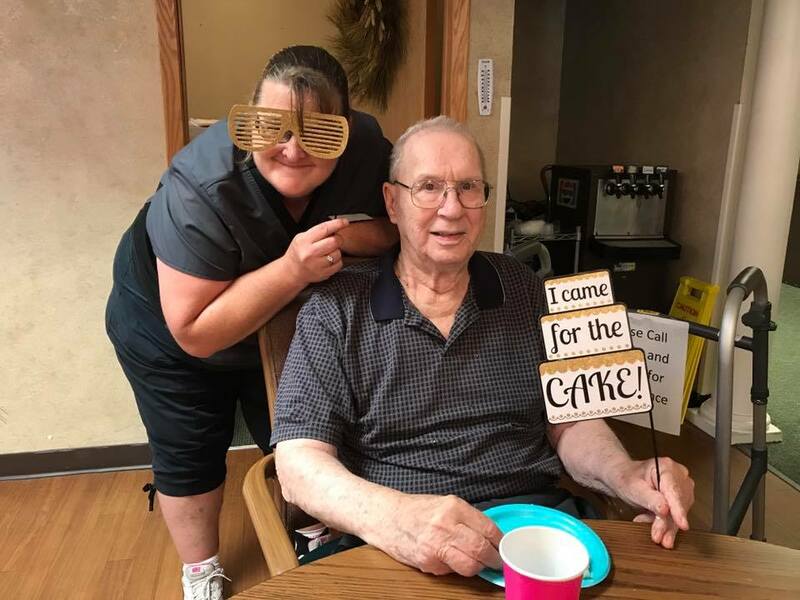 She has stepped up and helped us school carnival days, National Nursing Home Week Activities, and thoroughly enjoys doing the “out of the ordinary” for our residents and tenants. She’s always willing to dress up for our fun days, and makes suggestions for other fun staff activities. Rene’s dedication to our building does not stop there. When we decided we needed a med aide on staff, she jumped at the opportunity to get her certification. She went back to school for us, got her certification, and is about finished with her med aide floor training. She is learning fast, and is a tremendous help to our nurses. She can multi-task, prioritize, and still find time to get everything done. Rene has no problem staying late on shifts to help the next group, picking up shifts when needed, and coming in on days off to make sure we have the help we need. Thank you Rene for living our company mission, “Residents First, Employees Always” , every day! We are grateful you are part of our team!